I love-love-love my Anti-Aging Essential Oil Blend, which is an oil combination of 10 essential oils. Adding this cream with similar nourishing benefits is a great plus. Creams stay on your skin in a different way than oils do. I apply my Face Serum after I have washed my face and applied a witch hazel toner. After it soaks in (5 minutes or so), I will go back and add this cream, especially around my eyes (being careful to not get too close of course). Frankincense essential oil -anti-inflammatory, antioxidant, antiseptic, astringent. One of my favorite oils with great healing qualities! Myrrh essential oil – contains a number of flavonoids which assist in reducing inflammation and boosts the immune system. Rosemary essential oil – natural oil antioxidant (naturally helps to preserve oils). Helps to ease lines or wrinkles, regulates oil production, increases circulation, and cleanses skin. Lavender essential oil – very healing to the skin, mild, antiviral and antibacterial. Geranium essential oil – healing to the skin, balances oils, mildly works to reduce acne, eczema, cellulite, stretchmarks, scarring and dry skin. Plus Cedarwood, Birch, and Grapefruit essential oils. 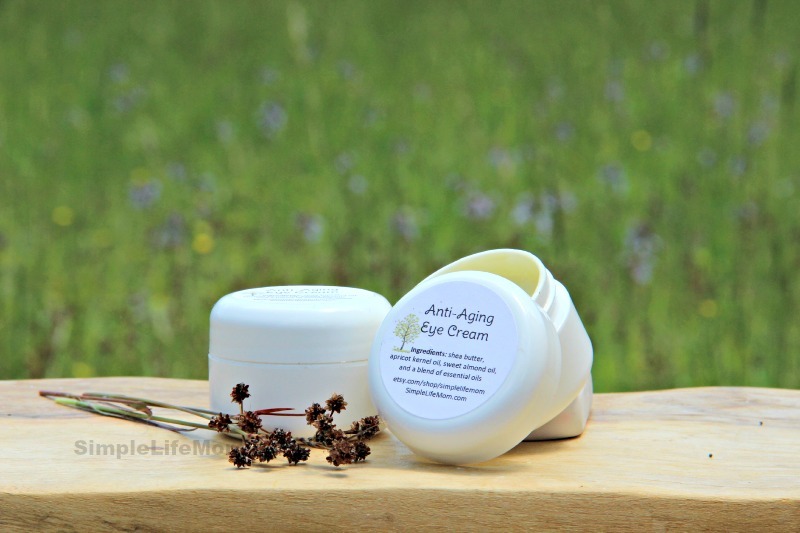 This cream is made with a raw Shea Butter base that is whipped before whipping in the oils. It can keep up to 6 months, though the oils may begin to separate after that long of time (I use mine up much faster than that). Some of these oils are extremely potent. Please be careful to test first before putting around your eyes. Try it on the top of your hand or your wrist. Where to find excellent essential oils? Place the carefully measured shea butter in a large bowl. Whip with a beater until it is smooth. SLOWLY add apricot oils, blending as you pour (otherwise it will be lumpy). Add essential oils and whip for 1-2 minutes. Any questions? Have an essential oil you love? Please share your comments and wisdom below. I don’t have rose hip EO do you think this will be effective without it? Thanks. I found you from Homestead Barn Hop. Yes. The oils really work well together, but if you don’t have one it will still work nicely. One I would not want to go without in this combo. is the carrot seed oil. Ooh, thanks for catching that. I add 5 drops. Lavender is very mild so if you want to add a few more go ahead. Awesome! Thanks for answering all my questions. Can’t wait to make this! This cream looks amazing! Thanks for the recipe and the submission to the HomeAcre hop. Feel free to stop by at http://www.PintSizeFarm.com or another one of the hosts to submit another this week! wow. Looks wonderful. How long have you been using it? For about 6 months. My skin has healed so much! I want to try this as well as your Super Anti-Aging Serum but am having trouble finding rosehip essential oil. Mountain Rose Herbs has several variations of rose EO, but they are made from petals and not rosehips. Any suggestions? Rose essential oil is amazing for the skin, it’s just usually more expensive. If you have the means to buy it then it’s definitely a good substitute. Otherwise, try bulk apothecary. I find some of my oils there sometimes as well. Mountain Rose Herbs has superb rose hip oil and it is a great price for the quantity and quality. This looks so great! I love making my own beauty products. Thanks for the great tutorial. Are the oils from MRH therapeutic grade? I would like to try this, but I use therapeutic grade oils and am wondering if I should use the same amount. Yes, use the same amount. There is no such thing as therapeutic grade. It’s a marketing tool. There is no test to measure “therapeutic grade”. Just do your own research. There are many many companies that sell great quality oils. Mountain Rose Herbs is one of them. It is not regulated, but if you have a company saying they have oils that are therapeutic and some that are not, it makes you wonder what was done to those oils to make them say they should just be used for aromatherapy. It could be that they weren’t picked at the prime time, the plants were in sorry shape, or are they adulterated in a more sinister manner? So, use that as a caution sign. I just found rose hip essential oil at Vitamin Cottage, NOW Foods brand for ~$5. Making this right now. It’s too cold in my house to whip the shea butter thou. I’m melting over very low heat, then will let cool slighty, add eos and whip. Thank You for giving us this formula. Can’t wait to try it. HI! Just found your website and I haven’t been able to do anything else except read all your awesome recipes!! lol Wow, goldmine! 🙂 I would love to purchase your anti-aging serum and eye cream, but I am breastfeeding. Do you know if all the essential oils in your product are safe to use while nursing? Love Love your site! Thank you for sharing all your knowledge! Fantastic Kelly! I’ll start my research and will ask my midwife too! Will get back with you, thanks! I was wondering what size jar you recommend putting the lotion into. It makes about 4 ounces. Thank you Kelly. I am really excited to try this tonight! Hi Kelly! Was wondering what the shelf life is? Do I need to refrigerate? Thank you! During summer and Fall months it stays fresh longer in the fridge. The cold will slow the oxidation of the oils (and any bacteria you may introduce with your fingers). Under good normal conditions it will stay fresh for four to six months. Does this blend of EOs and carrier oils work well for repairing dark circles? I’m trying to break the recipe down to a smaller amount to test, and also add a tiny bit of beeswax to harden it a bit during our warm months. Hello Kelly!! Just made your recipe and wanted to preserve it till Xmas. Can I refrigerate or freeze it till then? It keeps in the refrigerator for a very long time. Without being opened or touched, it should be fine in the fridge. I’ve never tried freezing it. I’m not sure if it would change the texture or not. Just came across this recipe & I have a quick question. Do you use 1/3 cup EACH of almond & apricot oils, or is it 1/3 cup of those 2 combined? Just wanted to clarify, as I would like to give this a try – thanks! It is 1/3 cup total. You can use whichever you have on hand. I am just gathering all of the ingredients to give this cream a try. do you mean 1/3 sweet almond oil and 1/3 Apricot kernel oil? 1/3 of a cup in total between both of the oils? 1/3 cup total. Choose your combination. Would u be so kind to let me know how much does this recipe make in oz./ and how much does a batch cost you , at least approximately? One batch whips up about 8 oz of lotion. Price will vary depending on what brand of essential oils you use. Can I use calendula infused oil and grapeseed oil instead sweet almond oil and apricot kernel oil. I read that they quite good as well. Yes, you can use whatever carrier oil you prefer. I am new to essential oil cosmetics and it is sometimes very difficult to make right choice of oils as on different sites different oils (except couple like lavender and frankincense) promotes as most useful or must have. I needed oils for the face and spider veins, so I bought frankincense, carrot seeds, geranium, rosemary, cypress and lavender. In number face serum recipes used different oils and I thought that I would use what I have (except cypress), just will add necessary number of drops in carrier oil (grapeseeds). I know that this serum might even be a substitute for serum and moisturiser together. How to decide what to use in eye serum? It should be something delicate, but above oils very potent and if diluted in right proportion should be delicate enough (one drop of serum for both eyes gently applied). I found lots of recipes, but nobody explained the difference in using oils for the face and eyes. Just number of oils used. I would love if you can just point me to the right direction. Essential oils are very potent. Those used on the body are usually done for some medicinal purpose, not just for scent. People will choose something like cypress, which is great for vein health, and add it to a carrier oil for veins on their legs. Or they may use antiviral or antibacterial oils for a cold. Oils chosen for the face are usually chosen for other reasons. That is why someone may mention carrot or frankincense (great for draining sinuses and reducing inflammaton under eyes). Carrier oils need to be used of course to dilute them, because many are strong enough to do more harm than good if not diluted. The area around the eye can be very sensitive so we need to make sure they are diluted to 1-2% to be safe. I hope I answered your question. If not, let me know. I just made a batch of this cream. It’s worked out beautifully! I no longer buy store- bought products and this recipe is both simple and full of natural oils. You’re welcome Cate. I’m so happy to help you find something that works great for you! thankyou for being so honest and posting the actual recipe on line. i wanted to make my own after searching essential oil for what i want. I aim to reduce inflammation arround my eyes due to graves disease. i decided your formula is so close to what i was going to do, i decided just to order your cream and try it out. i am going to add blue chamomile. 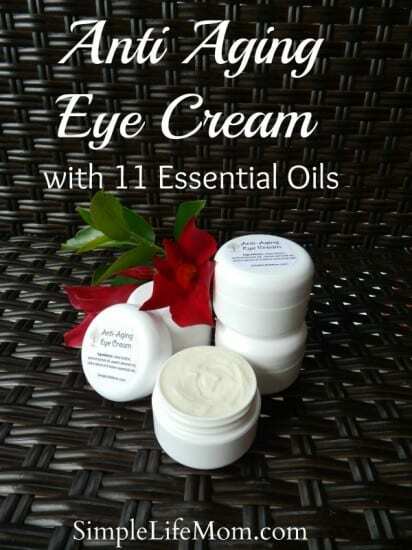 to your eye cream as it is mentioned on many sites for graves eye disease. i may add Birch later, but i saw some health concerns for birch. do you see any negative interactions with your choice of oils and chamomile? i f this works i will post some pictures of my eye before an and after. i expect it will take a few months. I tried this lotion following the insctructions and it turned out great, really fluffy and easealy absorbed by the skin. I was wondering if there was something I could do to reduce the greasy feeling of it that stays somehow after it penetrates the skin. What would you sugset reducing the shea butter? the apricot oil? or maybe adding some arrowroot powder or even maybe some aloe vera gel? I am not sure really. You can add 1\4 tsp arrowroot powder. Any more can dry out the skin. Aloe won’t mix with the oils and changing proportions will just change the thickness. I promised to leave some feedback with the wonderful facial kit I brought on Etsy, I have to say that the eye crème is one of the most gorgeous cremes I have ever used, I use it not only on my eye area but also face and neck, its so velvety and nutritious for my skin, just love it!! I hope one day soon I can afford the larger jar unless Im driven to make it, id love to try all these recipes in my kitchen one day. But for now, I’m very very pleased with the crème and the purchase, thank you for such an insightful blog and also having a shop outlet that is convenient to those that dont have the time or extra budget to buy all the ingredients, God bless you and your beauty business. What a wonderful review! Thank you so much. I’m so glad you love the eye cream. It is some lovely pampering for the skin. It was great to hear from you. It is so great formula! Thank you so much. looks great!! can we use it without shea butter? also can we use olive oil or Avocado oil or coconut oil instead of almond and apricot kernel oil? The extensive list of essential oils will be quite expensive, especially using them for just one purpose (that being the eye cream). I am unwilling to purchase 11 essential oils that will eventually go bad and be a waste of my money. The above preamble leads to my question: Rather than purchasing the plethora of essential oils in your recipe, can one just use a few EOs so long as the total amount of EO drops remains the same as in your recipe? In other words, your recipe calls for a total of 29 drops of essential oils total spread over 11 different EOs. Rather than using all 11 EOs, can I just use say 2 or 3, so long as my total EO drop usage totals 29. Hi Melanie, thanks for your questions. First, essential oils will not expire or lost their potency of stores properly. That being aid, I understand that buying 11 esential oils is very expensive. I can’t say use the same drops because some essential oils are stronger on the skin than others. However, a blend of carrot seed and frankincense or geranium would be a potent formula for an eye cream. I would use around 5 drops of each still. You will gain your maximum use at this level. Any more may be too much for your skin or wasteful. I made this recipe exactly as stated and it’s very runny like a lotion. What can I do to stiffen it up? The type of shea can effect the thickness. If your shea was grainy instead of like cream it tends not to fluff as much. Sometimes you just need to whip more air into it to thicken it. You can take 1-2 tablespoons of shea and whip it by itself (otherwise it will just be lumps in your eye cream). Once it’s smoother and creamier you can add it to your eye cream and blend well. This should thicken it up without leaving any clumps. What shea butter do you recommend? Mine feels gritty and I whipped for about 8 minutes. That sounds like the culprit. It works just as well, it just doesn’t whip like others do. It’s really hit and miss with a lot of raw shea companies. I haven’t found one to be consistent. Next time you use it, just make sure to use a little more then what the recipe calls for. I love your eye cream recipe! Should I apply this before or after sunscreen? How long does this last? How do I store it so I can maintain its potency? Thank you! Im so glad you like it!! Apply before sunscreen. Keep in a dark, cool place. If you have super hot summer months then you may want to consider keeping in the fridge, but it’s not necessary. Even if it “melts” it still maintains its potency. Wow, that’s easy! I am so excited to try this. Thanks! I would like to know what EO brand you use to make this eye cream? I use Mountain Rose Herbs or Starwest Botanicals. This looks awesome, I can’t wait to make it. In the directions almond oil is listed, but in the list of ingredients it isn’t. Just wandering if you used it and how much? You can use some in place of the apricot kernel oil if you like. That was left over from a previous edit. Thanks for catching that. Hi Nicola, you can add a few drops of a stronger scent that you like, such as lavender or orange. This will mix with and help mask the carrot scent if you don’t care for it very much. Hi there, I’ve made your anti aging face serum…….oh the best is that the essential oils have been giving me soooo much better sleep when I apply just before bed! And I love your antiaging body cream with spf! Now I’m about to make your antiaging eye cream but have a question…..the instructs say …while adding apricot and almond oils but the recipe doesn’t mention almond oil.. Is it just the 1/3 cup apricot kernel oil? Also, since I began making my own “body butter ” several years ago ( but before learning to add Essen oils ) I’ve always melted the butters in dbl boiler (Shea, mango, cacao) then cooled them in the fridge , prior to whipping and that took care of any lumps. I do this with your cream recipes too. Looking forward to see if I need almond oil for the eye cream thank you so much! I had the option on there for using apricot kernel or sweet almond oil, but it was causing confusion so I deleted it. Just use apricot kernel oil. For a whipped butter you do not want to melt the shea first. This doesn’t have cocoa butter so you don’t have to worry about the hard consistency. Just whip the raw shea butter until smooth and then slowly add the oil. Hi, do you think this would work with mango butter? I have a sensitivity to shea butter, but would love to make this eye cream. Hi kelly, I love this cream! Been using it for a few months now. I was wondering if Im able to use this one my face as well? It says Eye cream however it has all the good things in it 🙂 would it help for fine lines on the face? Yes, feel free to use it all over your body. ? Any reaction should show up in the first 15 minutes. A few drops in the entire batch doesn’t seem to cause a problem. I use it during the day and burn very easily and havent had a problem. But if you have any doubt, definitely use it as a night cream. It is thick enough that it may be better for you if you wear makeup throughout the day. Hi Kelly, I tried your anti aging eye cream and love it. Since then I made a batch according to your recipe. It did not turn out as smooth and fluffy as the one from your store, quite grainy and more liquid. Should I first melt the Shea butter and add some wax? Is your shea butter grainy to begin with. Some are and need to be gently and melted and allowed to completely cool and harden again before use. If your shea butter is smooth, then it was how you processed it. Remember to run the mixer on just the shea butter to whip it before adding any oil. Once you add the oil, let the mixer go long enough for it to whip air into it and make it nice and fluffy. Hi Kelly, just came across these wonderful eye recipes and I plan on trying a blend of carrot seed and frankincense or geranium for an eye cream (five drops each). What carrier oil would I use, and how much please? There are a number of great ones: Apricot kernel oil, hazelnut, rosehip are all great. If you have another that you like on your skin then use what you have. Do you sell these already made?